Witnesses saw Wanpen Inyai jumping into a pond at Samut Prakarn Crocodile Farm and Zoo on Friday, reported The Bangkok Post. Staff failed to rescue her. Police said they were told by family members that Ms Wanpen appeared depressed prior to her death. Thai tourist attractions are said to often have lax safety rules. Thai police confirmed Ms Wanpen's death on Tuesday afternoon. According to reports, she took off her shoes before jumping into the middle of a pond said to be up to 3m deep that contained hundreds of adult crocodiles. 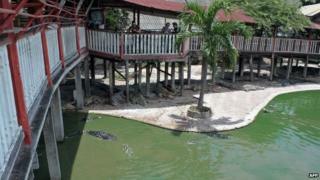 Staff tried to use long sticks to stop the crocodiles from attacking her, according to the Bangkok Post. Earlier that day, Ms Wanpen's family had tried to file a missing persons report after they discovered her disappearance, but they were reportedly told to wait for 24 hours. Her death mirrored that of a woman who killed herself in 2002 the same way at the same farm, and another suicide reportedly took place a decade before that. Farm owner Uthen Youngprapakorn told a local radio station that the farm had already installed additional fences and other security measures along the walkways. The farm claims on its website that it has more than 100,000 crocodiles. Pictures of the farm show wooden pagodas on stilts, connected by walkways that have chest-high railings, situated over large ponds.